Agent Thompson codenamed Pong, was slumped in his deck chair on the bridge of his yacht. His hack ached from the strain of too many hours standing at the wheel avoiding Hawaiian Coast Guard vessels. He had successfully thwarted smugglers from reaching their conspirators off the coast of Oahu. Now the yacht’s holds were filled with contraband to be delivered to the shipyards in San Diego. There would be no publicity for this job-just the usual payoff in some obscure location. Wonder where I’ll be sent next time, he wondered. This mission was a lot like my first-what is it now-ten years ago. How many different missions could there be? Pong checked his fuel gauges and plotted a course to Point Loma. What does an Administrator do when the players have sent their characters on every published TOP SECRET/S.I. adventure available? He must think up all-new adventures, of course. But what does an Administrator do when the agents have completed every mission he can think of? The Administrator could disguise old plots with new settings, tougher bad guys, and deadlier weapons, but this leads to character-trait inflation, device hording, price increases, and more violence. The Administrator could also twist and combine a multitude of old plots into a confusing mass of mystery and complications. Some players may enjoy this, but players lacking the patience or role-playing skills to unravel such Gordian knots will react by having their agents shoot at everything that moves. The players will miss valuable clues and plot subtleties painstakingly arranged by the already weary and frustrated Administrator What can be done? This article is an aid for the Administrator who is caught in a war of escalating firepower or is frustrated with player apathy. Herein are “mission starters! Mission starters are short (in some cases, extremely short) Administrator’s briefings giving the background of each mission and details on “what’s really going on!’ Mission starters allow each Administrator to detail the subsequent events in the adventure to suit his gaming style. These adventure introductions are spark plugs to ignite the imagination, springboards to launch new campaigns, breaths of fresh air to enliven stale gaming sessions. Mission starters are sources of new ideas to help an Administrator create a full-fledged espionage campaign or a “quick” one-night mission with little preparation required. 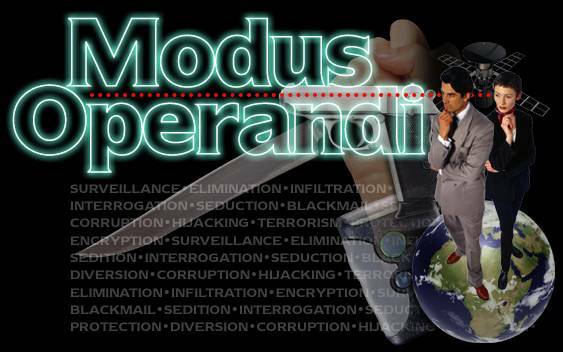 Breaking the mold An Administrator who wishes to breathe new life into a stale espionage campaign must be prepared to break the mold from which his previous adventures have been cast. There is no reason why one or more missions cannot be set in atypical time periods or settings in the 20th century. Adventures could be set in World War II, the Korean War, the Vietnam War, or the Arab-Israeli Wars, or built on any other modern historical event, such as the capture of Gary Powers by the USSR, the Bay of Pigs invasion, or attacks by the PLO. The names of real people or organizations could be incorporated into your adventures, or the adventures could be based on spy novels and movies with espionage and antiterrorist themes. An old set of DRAGON Magazine writers’ guidelines gave some module-design tips to explore, focusing on the need for new, exciting, and exotic settings, which are expected in espionage-style RPGs. As the guidelines noted, environments like the Peruvian Andes, the steaming jungles of Thailand, the outback of Australia, and the inner cities of the American east coast are as different as can be, and are all worthy of consideration. Adventures can occur aboard submarines, supersonic jetliners, and anywhere else that a secret agent might face death for high stakes. When creating adventures, I often pick an interesting setting first and design the mission second. DRAGON Magazine modules “Dr Yes;’ “Mad Merc;’ and “Operation: Whiteout” were all designed in this manner as were Operation: Sprechenhaltesidle, the adventure that came inside the boxed 1st-edition TOP SECRET game, and TS006 Ace of Clubs, another early TOP SECRET module. Then, too, I was asked to do a series of mission starters for Orion’s Taurus Bureau in TS3 Orion Rising. All of these missions had to occur within a specific geographic area. I guess I’m not the only one who thinks location first and mission second. Location need not come first in mission design. In “Operation: Meltdown;’ which appeared in the TOP SECRET Companion, I picked non-player character types before the setting. I wanted ninjas, neo-Nazis, organized crime figures, and terrorists to populate the module. Next, I had to figure out where each of these NPC types would be found, and so I chose Japan, the Amazon rain forest, Sicily, and the Middle East for the locales. Finally, I created a plot combining all of these diverse characters and locales (including the Concorde) into a cohesive whole. If you try this, use care to avoid having the resulting plot seem contrived, overly complex, and unrealistic. Relationships between well-developed player characters and NPCs create interesting and rewarding role-playing experiences. Interactions based on these relationships enhance the plot by adding depth, reality, and complications, but missions should not be based solely upon them. An exception to this might be in an advanced role-playing campaign where allegiance to the agency is being tested by the infiltration of an “enemy” agent in the party. Emotional relationships among characters and between characters and NPCs can also be tested during a mission, but such testing itself should not be the reason for having the mission. Beyond changes in settings and characters, there are other areas on which you can focus your attention when designing unique missions for your players’ agents. For example, according to Raymond Benson’s The James Bond Bedside Companion, certain elements commonly appear in Ian Fleming’s James Bond books. These recurring elements, which Fleming combined so successfully in each of his novels, are: Places, Girls, Villains, Villain’s Employers, Villain’s Projects, Minor Villains, Bond’s Friends, and highlights. The highlights included gadgets, violence, gambling, exciting discoveries or meetings, and usually include the climax of the story. These same elements appear in the Bond films by Eon Productions and also include a new element: the Obligatory Sacrificial Lamb. Some character we are meant to like is threatened or killed in each film. The films also rely far more on gadgets as plot devices than do the books. If you include each of these elements in your mission, you have a good start. But though these elements make each such book and film interesting and entertaining, it is the plot line that turns these elements into a good story. The settings are where the action in each story happens. The characters make the plot happen through their actions and thoughts. An espionage story in your own backyard with next-door neighbors as NPCs could be extremely thrilling if the plot connecting these two elements is well conceived and well written. For Administrators, who are storytellers after all, these plots are the PCs’ adventures. An Administrator may have prepared the required locations and NPCs, but the players provide most of the action. Therefore, an adventure doesn’t always go as the Administrator plans. The plot’s afoot Georges Polti, in his book, The Thirty-six Dramatic Situations, proposes that all fiction stories can be distilled to three dozen basic plot situations. Each of these basic situations has several subdivisions that can he considered variations on a theme. Each situations can be combined with one or more others to create a complex plot line. The skill with which these situations are developed, combined, and written is what makes the difference between a good and a bad storyteller-or Administrator. Each plot situation given in Polti’s book contains several essential elements, with lists of items that can be used as these elements. Any item on an element list can be interchanged with any other item on the list within a story. For example, the elements of the situation “Madness” are Madman and Victim. Under the element “Madman” are listed: Mad Scientist, Religious Leaden Military Leader, Politician, and Terrorist. Under the element “Victim” are listed Captive Subject, Unquestioning Followers, Ordinary Citizens, Opposition Party Members, and Innocent Bystanders. A plot can be constructed in which a Mad Scientist (Dr. Frankenstein) interacts with a Captive Subject (the Monster), an Unquestioning Follower (Igor), Ordinary Citizens (Frankenstein’s fiancé), Opposition Party Members (the town’s burgomaster), and innocent Bystanders (the townspeople). Another series of plots can be constructed in which a Religious Leader interacts with all the listed Victims, as in a situation like that involving the Reverend Jim Jones a few years ago. Eric Heath, in Story Plotting Simplified, adds a third element to Madness: Cause. In many espionage plots, the Cause is World Control by some devious and devastating means invented by a master criminal. Smaller-scale Causes by less-powerful antagonists lend themselves to more believable plot lines. A small-time arms smuggler trying to make an excessive profit by selling obsolete weapons to Afghan rebels is a more likely real-world story. A well-developed Third World mission may be more satisfying than saving the world. Making a mission to create your own mission starter, you must first choose a dramatic situation. I’ve made your lob a little easier by reducing Polti’s 36situations to six that deal primarily with espionage role-playing. These are: Deliverance, Revolt, Daring Enterprise, Abduction, Obtaining, and Madness, as given in the tables in this article. Under each situation are listed essential elements. Pick an item from each element list or add your own items. Using these chosen items, compose your own mission starter. Keep in mind that items on the element list need not be individual human beings or concrete items. Abstract ideas such as liberty, national security, allegiance, and love can also be at stake. Spear of the Gods: Web has developed a land-based energy weapon that can track and damage aircraft and space vehicles in low earth orbit, such as the Space Shuttle. Agents are to confiscate the weapon plans and destroy the device. High Jacks: Sub-orbital supersonic aircraft developed by several countries are now believed to be the chosen targets of European terrorists sponsored by Web. Agents are to prevent a sub-orbital skyjacking by a crewman in the pay of a West German radical group-but which crew-man is the ringer? Channel Changer’s: France and England decide to build an English Channel tunnel connecting the two countries. Terrorist action and sabotage at the opening ceremonies in the tunnel most be prevented. Oops! Our’ Mistake! The Agency accidentally supplied a very important operative with the wrong briefcase. She is assigned to a difficult mission deep inside foreign territory. Instead of a standard agency briefcase she was issued a “reduced efficiency” briefcase, commonly known in the business as a “slow death special?’ The inside of the case is radioactive, and the handle is permeated with contact poison. The agency regrets the blunder and wants the briefcase back. The unsuspecting agent’s delicate mission is not to be jeopardized. The PC team is assigned to recover the briefcase, replace it with the proper variety, and return without alerting the enemy-and, if possible, without alerting the agent. Highrise Hijinks: A skyscraper becomes the site for industrial espionage. A newly developed electronic device shields computer keyboards from emitting electromagnetic signals that can be picked up by sensitive surveillance devices. Agents are assigned to pursue rival company thieves who break into offices and attempt to steal the device prototype or its plans. More Than You Bargain For: The nerve center of a vast arms-dealing and terrorism empire is headquartered within the confines of a Middle Eastern open-air-market populated with cutpurses, cut-throats, and cut-outs. The agents must shut this operation down-permanently. Rumble in the Jungle: A secret Nazi stronghold deep in the Amazon rainforest is camouflaged as a solar energy research station, including natives, piranha, machine guns, and quicksand. Agents must investigate the stronghold but must not disturb it or its inhabitants (a later mission will do that). Mine for Keeps: Radioactive material are being mined and smuggled out of the Old West, A treacherous mining zone, Secretly buried beneath a tourist-filled ghost town, becomes a site for dynamite, disappearances, and daring deeds. You Must Sea To Be Shore: A modern pirating operation is based several fathoms below the ocean’s surface at the site of a crumbling shipwreck. The area is in a national historical site protected by the local government. The agents must gather evidence to show that the operation exists and must be shut down, but they cannot damage the site in anyway. Safari Sogoodv: An isolated animal compound for zoo specimens, situated on the African plains, turns out to be a plush, well-concealed, and well-protected hideaway for a fabulously wealthy master criminal who runs a pan-African poaching cartel. The agents discover this by accident while on a different mission-and the master criminal wants them dead. It’s Dr Jekyll-You’d Better Hyde! A diabolical mad scientist tries to scare captive Orion agents to death in his labyrinthine lair of physiological and psychological endurance tests. Agents must escape from his guarded castle laboratory compound in a mountainous wilderness region. Mountain climbing and wilderness survival skills are necessary. Squeaky Wheels Get the Grease: Mercenaries and Arab extremists believed to be working for an oil cartel begin destroying oil drilling platforms in the North Sea, Venezuela, and in the Orient. It is believed that terrorist activity will decrease world oil production and increase oil prices among oil-producing nations. It is feared that attacks will occur on the Siberian and Alaskan pipelines. The agents must put a stop to the sabotage. Agents on Ice: This mission starter is presented as an example of a more elaborate backdrop for a series of adventures, possible a small campaign. Background: A wealthy, pro-Western Arab country is in desperate need of Water and it will pay any price to get it. American aid is sought and soon given, and a bizarre plan is hatched. In November; a massive iceberg is located by satellite just east of the Antarctic Peninsula, north of the Weddell Sea or Queen Maude Land. Why not take the iceberg to the Middle East? The iceberg is quickly streamlined with demolition charges, then lassoed by surface and submarine tugs using harpoon cannons to shoot cables into the ice; the cables have tension release connectors that snap if the iceberg suddenly rolls due to melting. The above water surface of the iceberg is covered with a heat-reflective material, and motion detectors are planted to predict rolling. The most economical vessels to serve as tugs are nuclear powered ships and submarines, Three surface vessels steer the iceberg and provide some pull. Submarine vessels provide the major muscle to move the iceberg’s enormous mass below the water’s surface. One surface tender and one submersible tender supply crew changes, food, oxygen, and other supplies to the tug vessels. To conserve momentum, the vessels never stop towing. Smaller vessels anti aircraft serve as current finders and weather patrols. Security anti rescue craft protect vessels in intersecting shipping lanes. The best route to haul the iceberg back to the Arab country lies in the direction of the Antarctic circumpolar current known as the West Wind Drift toward Australia. The iceberg will then he pulled northward across the Indian Ocean into the West Australian Current, then must travel along the South Equatorial Current until near the East African coastline, where it will travel north to the Middle East. The iceberg must hug the coastline so it will not be carried back out to sea by the Equatorial Counter Current. The iceberg should cross the equator- in July, August, or September during the wet monsoon season, before the dry monsoon season of winter starts to blow against the ice. The entire trip is scheduled for six to nine months from late December to early July. The total distance traveled is approximately 12,000nautical miles, of which 5,000 miles is in cold current to reduce melting. The shortest straight line distance across all the currents is 6,000 nautical miles. At the destination site, the iceberg will he mined and the ice dissolved. A slurry of ice water can be pumped ashore to either storage tanks or pipelines. Tanker trucks and other ships will transport fresh water to remote regions where the pipelines do not reach. Trouble: World environmentalists are upset about the entire operation. They argue that if the iceberg sinks an atomic powered vessel, the radioactive damage caused to marine life would be catastrophic. The effects of large quantities of fresh water in tropical and subtropical waters is unknown. The environmental impact of abundant fresh water in arid regions is another unknown. Many Middle Easterners consider the plan a terribly expensive folly costing millions of dollars. Other Middle, Easterners fear exploitation by industrialized nations loaning money for the project, providing technical support, and spreading Western ideals all along the water pipelines. Due to the tensions in the Middle East and the added environmentalist outcry the project is considered at grave risk from sabotage and outright attack on land and at sea. Assignment: Agents are assigned to the iceberg task force to detect and prevent interference with the project. Using all available means, the iceberg is to be escorted safely from origin to destination. Notes: This would be a superb multi session adventure in which the Administrator could toss numerous unique NPCs, plot twists, and deadly surprises at the PC agents. Tension should be maintained at a high level throughout the adventure, with agents chasing down clues and plots as the iceberg convoy goes its way. The climax of the adventure, if and when the iceberg reaches the Middle East, should be one the agents will remember for years to come-if they’ live through the fireworks. Further reading Benson, Raymond. Bond Bedside Companion. Dodd, Mead & Company: New York, 1984. Heath, Eric. Story Plotting simplified. The Writer, Inc.: Boston, 1941.Polti, Georges. The Thirty-Six Dramatic Situations. The Editor Company: Franklin, Ohio, 1921.